Néktər first opened in SoCal in 2010 and recently opened in Mountain View. I went with two coworkers during another trip to Belmont to pick up a controller. I got the acai banana berry bowl, which is acai, strawberries, blueberries, banana, and housemade vanilla cashew milk blended together and topped with hempseed granola, fresh strawberries, blueberries, bananas, and agave nectar. A coworker got the acai tropical bowl, which is acai, banana, pineapple, coconut, butter, and housemade vanilla cashew milk blended together and topped with hempseed granola, raw coconut flakes, bananas, and agave nectar. If you were to ask for my opinon on which is the better of the two, I’d say the banana berry bowl in a heartbeat. I’m not a fan of coconut water, and the blend in the tropical bowl had a taste reminiscent of coconut water (and looks like poop). So, if you like coconut water, get the tropical bowl! Néktər also has a peanut butter bowl, and a pitaya (dragonfruit) bowl. Açaí na tigela (“açaí in the bowl”) is a typical Brazilian dish made of frozen and mashed açaí palm fruit from the Amazonian region. Its preparation in Brazilian southern and northeastern is different from how it is prepared in the Amazonian region. It is served like a smoothie in a bowl or in a glass, is commonly topped with granola, banana, and mixed with other fruits, with the addition of guaraná syrup. Açaí na tigela is popular in Rio de Janeiro, Florianópolis, São Paulo and also along northeastern coast, where it is sold in most kiosks lining the beach promenade as well as in corner juice bars throughout the cities. The history of the acai bowl traces back to time before memory. Throughout the Amazonian basin the acai palm thrives. The edible palm heart and berry are a vital source of food for many people of the region. Unlike the modern incarnation of sweetened acai bowls, the acai berry pulp was (and still is) eaten as a staple, unsweetened and alongside manioc, and perhaps with a main course like fish.This is the original acai bowl. There is deep history between acai berry and the Amazon. But how did acai make its way out of the Amazon? Here is an account of the modern history of the acai bowl. In the early 1970′s, frozen acai pulp began to travel from the Amazon to northern Brazilian cities. In the 80′s, it was legendary Brazilian Jujitsu founder Carlos Gracie who likely popularized the acai bowl (frozen acai pulp blended with banana) in southern cities like Rio de Janiero. Gracie established his own brand of diet called the Gracie Diet which sought to maximize the performance of his fighters. A center piece of it was the acai bowl. You might imagine for a moment, his rough, tough, and buff students hanging out in Rio near the beach, eating an acai bowl on a hot summer day. More than a few impressed passerby’s likely remarked, “what are they eating?” with the hopes of manifesting similar physiques, bite by delicious bite. Sorry people, acai is very good for you, but not capable of creating miracle health breakthroughs. Aside from an organic acai bowl everyday, it will take some sweat and effort. As time went on Brazilian surfers and fitness enthusiasts began to partake in the acai bowl trend through the 90′s. In the 2000′s organic acai pulp first boarded a flight to the USA- the party was only just beginning. Hawaii and Southern California became the first places where the acai bowls really found a home. It was popularized by surfers who sought a tasty and healthy after session pick-me-up. Imagine eating cool organic acai topped with fesh banana after a mid-morning, scorching session: heavenly. 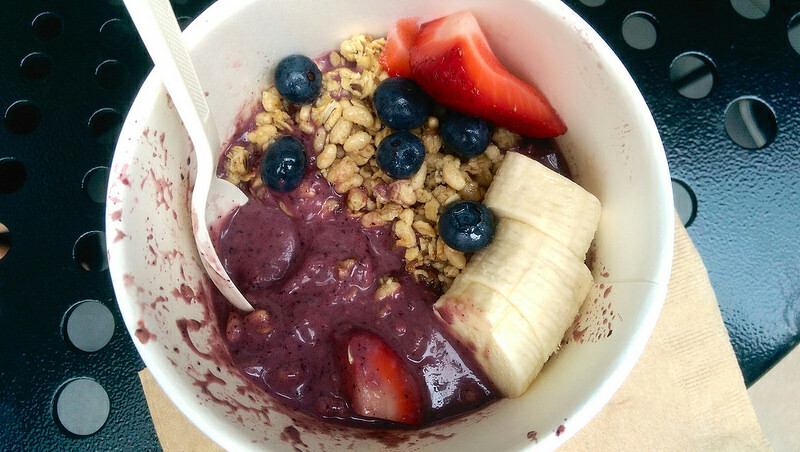 Acai bowls can now be found all over Hawaii and Southern California, where they have become a staple, and beyond.